I wanted to get this up earlier so that I could help those of the 19 who are having a little bit of difficulty piecing together last night’s events, but then I ended up sleeping until 2pm. First off: Last night was epic in every sense of the word. I loved meeting everybody, and I’m so excited that most of you turned out not to be serial killers. Everyone was fantastic, and I enjoyed literally every minute of the night/morning. Herm was treated like royalty by the Wings organization. The lengths to which they went to make this event happen were incredible. My brother called me and asked if Herm was an ambassador or a dignitary when he saw all of the great things the team did for him. At Hockeytown, one of the Wings’ staff, Nicole, informed me that after reading my post about the TweetSuite back in the fall, she had printed it out and given it to Steve Yzerman to read. I just about died. I’m still in awe of that. Prior to the game, I had this horrible feeling that there was going to be some sort of disputed goal that would result in the 19 turning into an angry mob and setting fire to the building before hijacking a freighter out in the river and sailing to a remote hideaway in the UP. To the surprise of absolutely no one, early in the first period, such an event almost transpired. The Wild apparently scored a goal that nobody in the stands saw enter the net. The play went to review, and even though I received text messages from home assuring me that the puck did not cross the line, I have no faith in the NHL’s review system. The 19 were getting restless. Torches and Molotov cocktails were starting to appear out of purses and pants. Shockingly, though, the call was reversed and was ruled to not be a goal. I was amused at how stunned we all were in the stands. The rest of the first period wasn’t particularly memorable. I was pretty concerned that the Wings hadn’t managed to convert on any of their powerplays during the first, since I figured even-out calls would be on their way. During the first intermission Malik got to ride the zamboni. He took one of the Bill-on-a-sticks with him. It was epic. Also during the first intermission, Lola passed out tin foil hats to our whole crew. I can only imagine what the people around us were thinking. As soon as we donned our hats, the Wings scored four goals. Coincidence? I think not. While wearing the hats, I figured out why we use them to cover things that are being baked. My head was on fire. My friend, Gabi, who is best known for getting her foot stuck in the back of the seat at the Joe in December, and I got a lot of questions about our headwear out on the concourse during intermission. I tried to explain, but people’s eyes kind of glazed over when I started talking about bloggers and insults and disallowed goals. I really, really, really wanted Franzen to complete his hat trick so that we could all show up to Arby’s together to receive our hard earned free curly fries. Alas, it was not to be. As far as I know, all but one of the LGRW chants started in the building last night originated in our section. If there was any doubt as to whether we’re the best fans ever, I think it’s safe to say that it’s long gone now. We sang Happy Birthday to Jimmy at least three times throughout the night. I was really disappointed that nobody else joined in, even after it was announced on the scoreboard. Several of us ended up stranded under the overhang at Cobo hoping that Hockeytown was sending another round of shuttles. Eventually we made it back to the restaurant, but it took quite a bit of pacing up and down the sidewalk, dodging taxis in the street, and debating about the best strategy to safely return to the Café. Herm got to go down to the locker room and meet Darren Helm. He got his stick, some game pucks, and an autograph on his jersey. We couldn’t get seated at Hockeytown so after milling around in the lobby for a while, we migrated over to the Town Pump a block away. This was the first time I’ve closed a bar in years. Years. Once the lights came on, we weren’t done yet, so some folks headed over to Greektown in search of some gyros. We parked in the casino parking garage and managed to get lost on the gambling floor and yelled at for trying to take a picture with the Bill-on-a-stick that I somehow ended up with. Once we found our way down to the ground floor, we got to take a walking tour of Greektown since we were on the opposite side of the building from the restaurant. We were denied entry to the New Parthenon because they apparently close at exactly 2:34am. Even though half of our group had gotten seated a couple of minutes before we got there, they wouldn’t let us in. Lame. Instead, we went to the first open restaurant that we found, and ended up at the Laikon Café. We had a fantastic time there, and our waiter was awesome. I finally made it to bed at 6am after having been up for 25 hours straight. It was just about 24 hours since I had left for work on Friday morning. 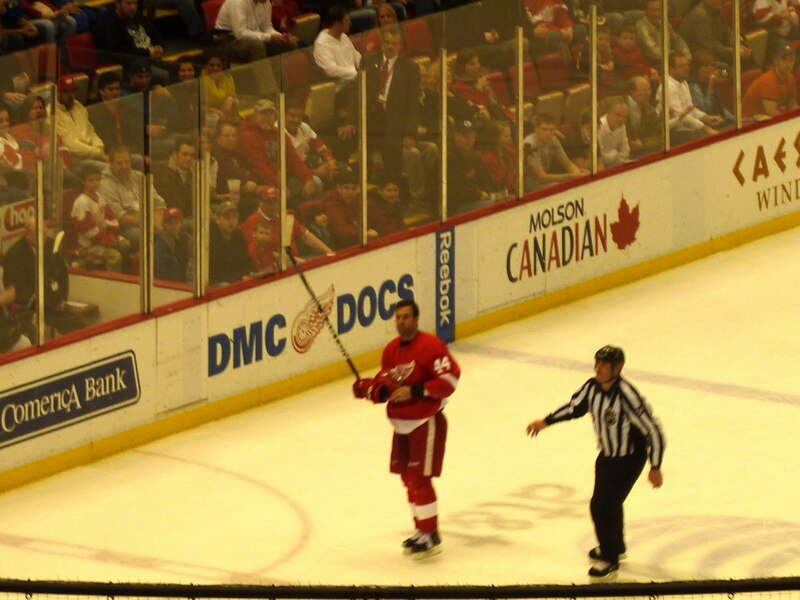 Todd Bertuzzi scores a hat trick and then winks rakishly at Petrella in the stands. My friend who is joining us gets her foot stuck in a chair at the Joe to the amusement of the entire H2H section. Again. I offered her five dollars to repeat her performance, but she was not willing to do it. Boo. Did they play this? I guess I wasn’t paying that much attention. No one has to file any restraining orders against the fake internet people they just met. Don’t get me wrong, I’m coming prepared with the paperwork just in case, but I hope it doesn’t have to get put to use. No restraining orders. I’m pretty sure I didn’t pick up any stalkers last night. I’ve been checking out my windows regularly all day and have yet to spot anyone. A reenactment of March 26th, 1997 at the pre-game party. No reenactment. There’s still time at the gathering today, I guess. The people sitting near our group in the stands leave halfway through the game in terror. I didn’t notice anybody leaving, but the other folks in the stands had to be wondering what on earth was going on. Between Malik on the zamboni with the Bill-on-a-stick and the section of fans wearing tin foil hats, I can only assume that people thought we were on a field trip from an asylum. A round (or 19) of toasts for the Chief who is with us in spirit. Finally getting to meet Herm and all of my other imaginary friends. This was so much fun. I’m normally pretty shy around people I don’t know well, but I felt right at home with all of you crazies. I don’t know if it was our shared level of insanity or the fact that on some days I twitter more with (former) strangers than people I actually know, but I had a great time. The Wingspan crew gets absolutely no footage appropriate enough to air on TV from the pre-game party. They actually did manage to put together some clips that were G-rated. So did Channels 2 and 7. Awesome. I even made it into a couple of the news clips, as did my mom. The Wings win (of course). Oh heck yes they did. It was glorious. Herm should be required to take up residence in Hockeytwon. Plenty of conversation about bacon, euchre, and Man Pocky. Too bad he couldn’t net that third goal or there really would’ve been pandemonium. Entire Arby’s franchises would probably have gone under if we’d showed up en masse for our free fries. For meeting with Herm and making his dreams come true. Yeah, you know which goal I’m talking about. I was terrified when that went in because it let the Wild back into the game. Luckily, the Wings managed to keep going and put the game away shortly thereafter. Red Wings fans are the greatest people in the universe. I'm waiting for video. There's video, right? It was so awesome! I was so glad to be there. Thanks for a great recap. I can't remember a time when I wasn't obsessed with the Wings and hockey in general. They are the great defining obsession of my life. Steve Yzerman is, and always will be, the hockey love of my life. I'm a graduate of both MSU and UofM (it's a long story), and will be living in the fine, fine state of Michigan for as long as I can hold out. I also contribute to Chicks Who Give A Puck and The Fourth Period. I can also be found on Twitter at @CWGAP_Kris.